Bob Church is a ferret owner and zooarchaeologist from the USA. A former photojournalist, he now has double degrees in Anthropology (archaeology) and Biology (zoology) and travels the world researching and sharing his knowledge of his favourite critters: ferrets. His current research is geared towards understanding ferret domestication, feral ferret issues, and improving ferret husbandry. Bob is well known in the international ferret community for his passion - not only for ferrets but also for Hawaiian shirts! 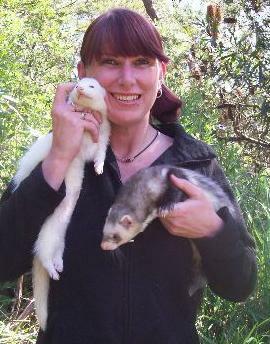 Dr Sandy Hume is a well known exotics vet from Canberra, with a special interest in birds, reptiles and ferrets. He is also passionate about dog behaviour. Dr Hume is the favourite vet of many Canberra pet & wildlife rescue organisations, and currently serves on the committee of the Australian Avian Veterinary Medicine Association. Dr Tom Lonsdale established several small animal veterinary clinics in the outer suburbs of Sydney during the 80s and 90s. In the late 80s he, along with a group of other vets, re-discovered the benefits of feeding pet carnivores — dogs, cats and ferrets — their natural diet. Tom worked hard to communicate the exceptional health, economic and environmental benefits to vets and pet owners, but met fierce opposition from an alliance of pet food companies, vets and fake animal welfare groups. Thus began an immense struggle that continues unabated to this day. Dr Lonsdale lectures world-wide, appears on TV and radio and maintains the website www.rawmeatybones.com. 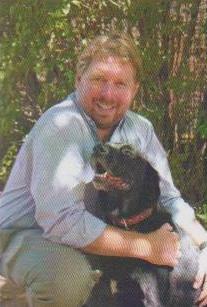 He is the author of the highly acclaimed Raw Meaty Bones and Work Wonders. Lynn was born in Nepean Hospital, went to school at John Wycliffe Christian School, before beginning University in 1988. She also began working at the Mountains Animal Hospital, originally as a Veterinary Nurse, working her way through University. She graduated in 1992 with first class Honours. Lynn was the original vet at Coreen Avenue from the day it opened. She loves all aspects of medicine and surgery, with a particular interest in ferrets. Her other interests include her 8 pets, gardening, photography, scrapbooking, music, swimming and skiing, as well as time spent with family and friends. Dr Neck graduated from Murdoch University in 1992 and has worked in a veritable plethora of practices since then. He has been at Cottesloe Animal Hospital since 1996 (and now owns the practice), and has completed membership examinations in Small Animal Surgery, Radiology, and Anaesthesia and Critical Care. David is currently Vice President of the WA Division of the Australian Veterinary Association and the AVA Nominee to the Veterinary Surgeon's Board of WA. He is also involved with the AVA New Graduate Mentor Program, and sits on the Schools Animal Ethics Committee and the Murdoch Veterinary Trust. Shirley is the co-founder of IFCA. She has been owned by ferrets for the past 15 years, and has been involved with several ferret societies over the years. 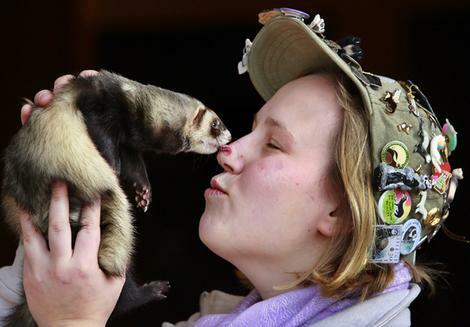 Her background includes nursing, laboratory technician and wildlife care which lead to a passion for understanding the "true nature" of ferrets. Her hobbies include reading, sewing, travel and enjoying a bottle of wine while dancing with the ferrets in her front yard. Sara has a BaAppSc (Medical and Applied Biotechnology) and works at Nepean Hospital in Penrith. She is a member and carer for the NSW Ferret Welfare Society and is currently owned by ten ferrets who definitely rule the house. She also loves reading, snow sports and camping. Shona is the co-founder of IFCA. She has been owned by ferrets for the past 10 years, and is currently involved with the WA Ferret Society, Ferret Society of Canberra, and Queensland Ferret Welfare Society. Shona's background is in computing and web design, and she is passionate about making the latest information & practical advice accessible to all ferret owners. Her hobbies include gardening, marine aquariums, and visiting family & ferret people around Australia (usually with her ferrets in tow). 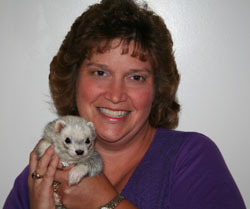 In October, Lori will be celebrating 25 yrs of operating a ferret shelter located in Ohio, USA. She has a wide range of experience in ferrets from being an owner, breeder, championship judge at ferret shows to facilitating Specialty and Championship shows. In 2007 she coordinated the largest ferret rescue in history which saw the re-homing of 586 ferrets throughout the United States and Canada. Her interest in ferrets has given her the opportunity to travel all over the world. Saskia has been owned by ferrets (as well as a menagerie of other pets) for 5 years and is involved with the Ferret Society of Canberra. She is currently owned by 4 ferrets, but as a rescue carer has not had "only 4" in her house for many years! Saskia is passionate about animal welfare and behaviour, and is involved with several welfare organisations including one which deals with feral cats. Her ideal evening is enjoying a glass of wine while watching the ferrets trash the house!